Every box must contain each number 1-9. The boxes are 3×3 grids and their outlines are marked with thicker line. 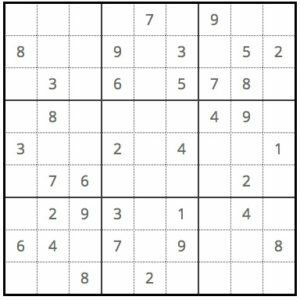 Each sudoku board has only one solution, which means that each square has only one possible correct number. 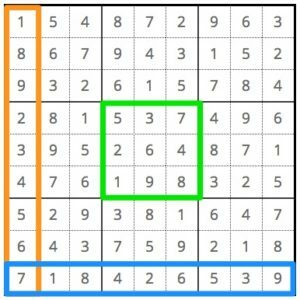 This allows you to use logic to find the correct number to place in each square. You can find the correct number to write either by eliminating every other number as a possibility or by eliminating that number as a possibility in that square’s shared row, column, or box. Some of the squares have values, your job is to fill in the blank squares. Notice how every row, column, and box contains every number 1-9. If you would like to play this puzzle, go ahead and play it now.